Keep your noggin warm in Doctor Who style with the Doctor Who Dalek Blue Beanie! 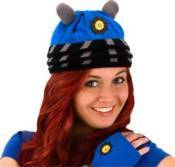 This beanie is made to look like a blue Dalek from the BBC TV show and even features black "ears" resembling the gun-mount weapons Daleks possess. The Doctor Who Dalek Blue Beanie is one size fits all.